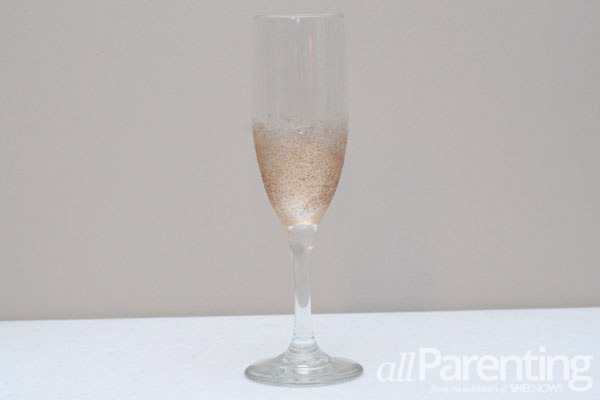 As you break out the Champagne on New Year's Eve, don't serve it in a boring, plain Champagne glass. 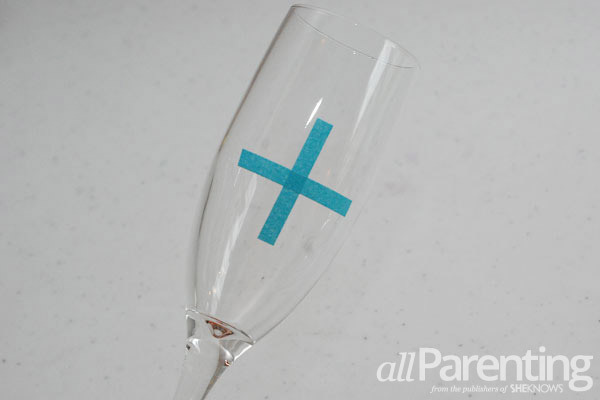 Add some elegance to ordinary Champagne glasses and ring in the New Year with a custom touch! 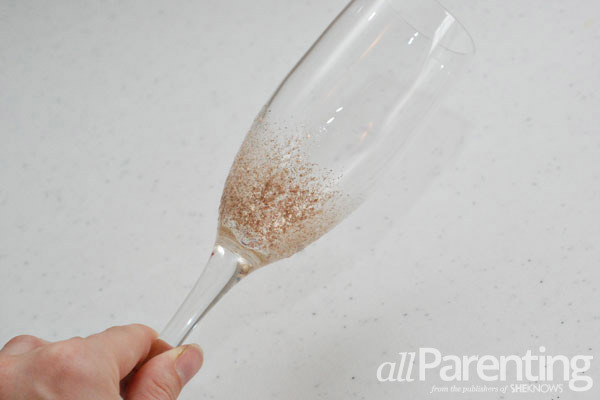 This New Year's Eve, when you pop the cork on a bottle of Champagne (or sparkling cider for the kids), serve it up in these sparkly DIY Champagne glasses. 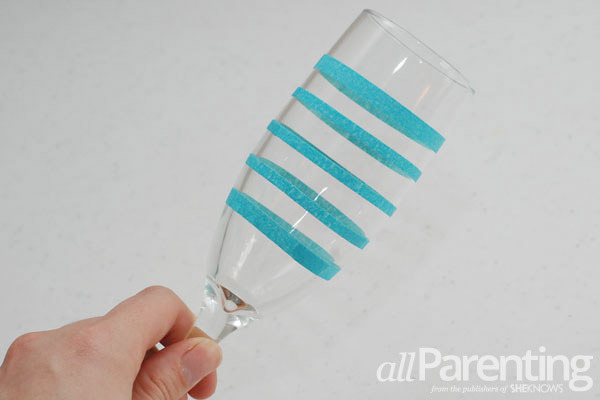 Inspired by this lovely tutorial from Something Turquoise, this DIY project is the perfect way to add some shimmer to your New Year's Eve festivities. 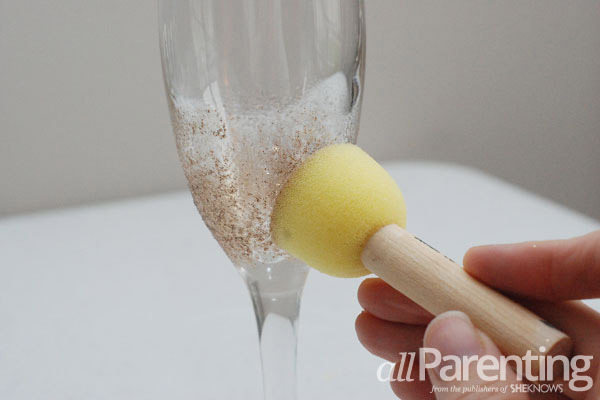 Start by cleaning off the outside of each of your Champagne glasses with rubbing alcohol to prep the surface. 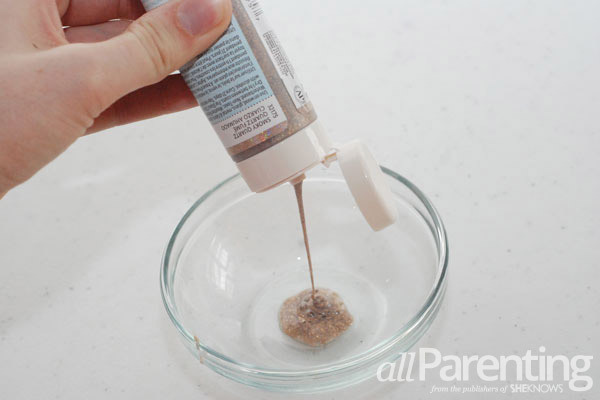 Pour your glitter paint into a small shallow dish. 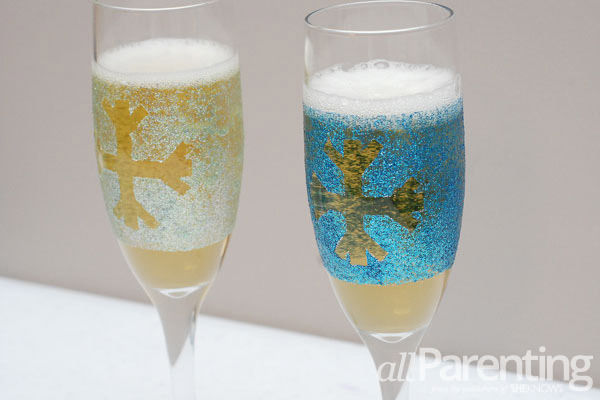 Dip your stencil brush into the glitter paint. 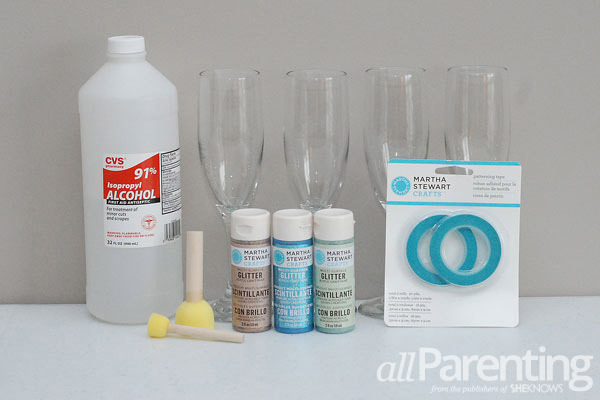 Start dabbing your paint onto the glass. Begin at the bottom of the glass and work your way up, stopping about halfway up the glass. 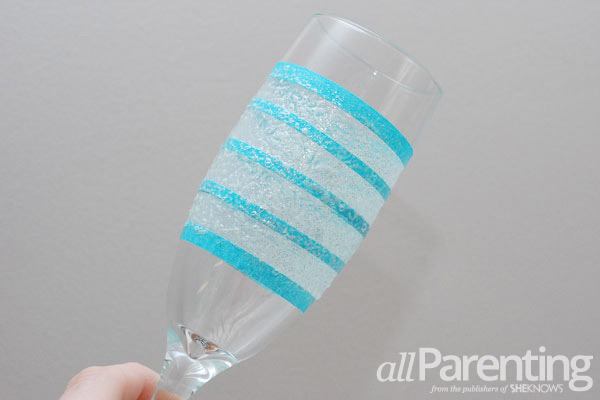 To achieve the gradient look, make the glitter paint thicker toward the bottom of the glass and thinner closer to the top. 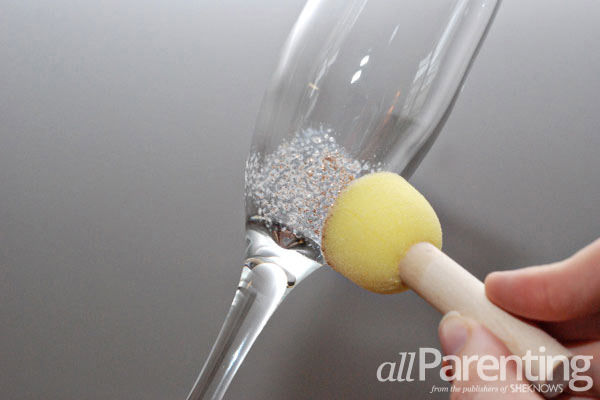 Set the glass aside and allow it to dry for 1 hour before applying additional coats of glitter. 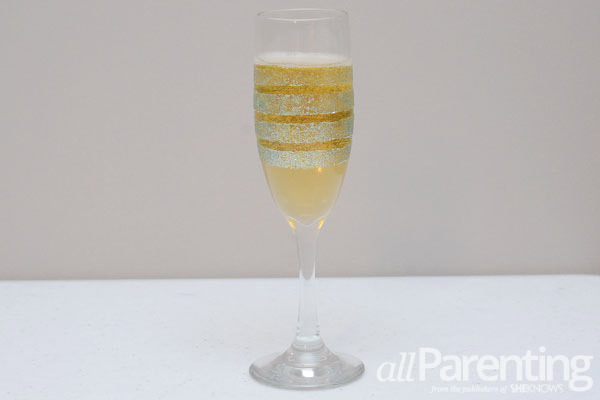 Keep adding layers of glitter until you are happy with the look of the glass. Be sure to let it dry for 1 hour between each coat. Once the glass has cured completely, it will be waterproof and top-rack dishwasher safe. The directions on the bottle say that the paint takes 21 days to cure completely. 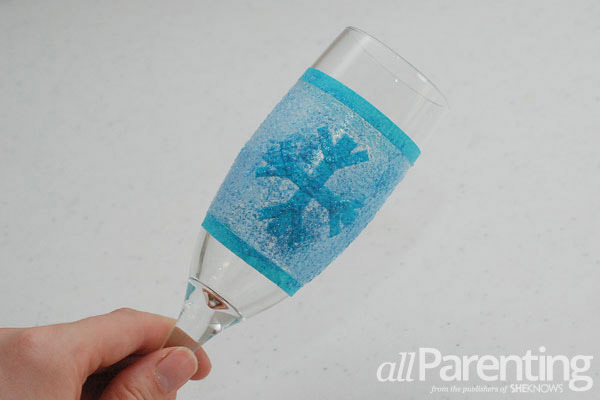 You can use the Martha Stewart patterning tape to make all kinds of patterns on your glass. 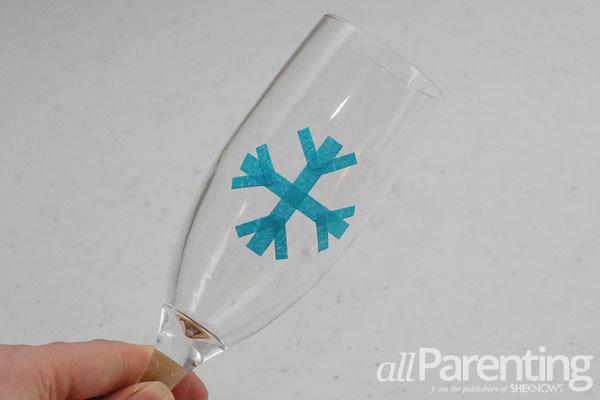 This snowflake design is quick and easy to make. Cut 2 strips of 1/4-inch wide patterning tape that are approximately 1-1/2 inches long. Cross them to make an "X" and stick them on the glass. Cut 8 strips of 1/8-inch patterning tape that are approximately 1/2-inch long. Use the small strips to make a "V" at the end of each of the longer strips. 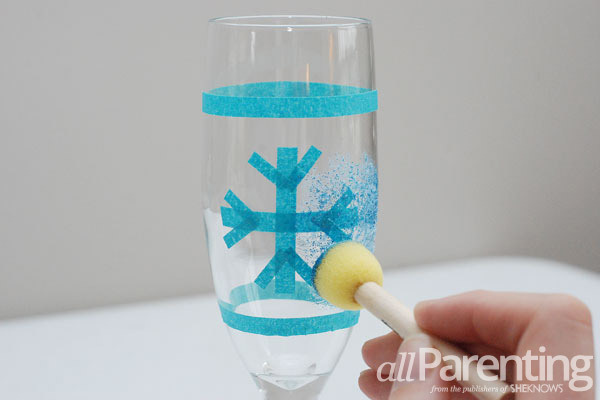 Use the 1/4-inch patterning tape to tape off above and below the snowflake design, then dab the paint over the tape with the stencil brush. Keep going until the whole area is filled in. Add 1-2 additional coats of glitter paint. 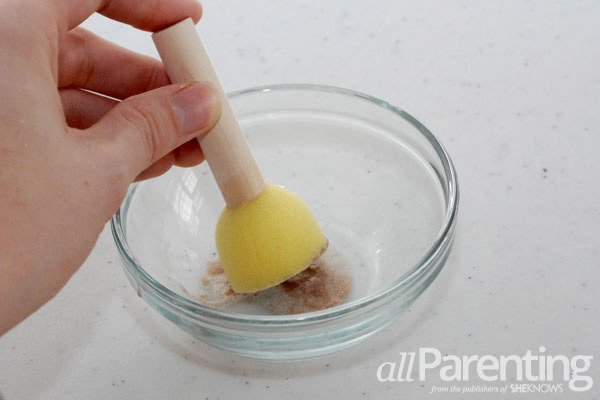 Allow the paint to dry for 1 hour between coats. 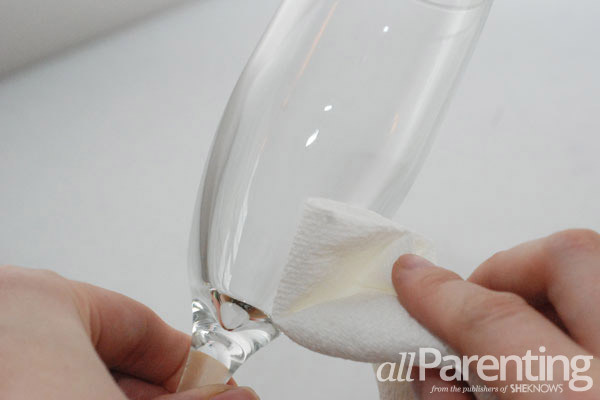 Let the paint dry for an additional hour, then carefully remove the tape from the glass. If there are any spots where the glitter seeped under the tape, scratch it off with your nail before the paint sets. Allow the paint to cure completely for 21 days before washing. If you would prefer to make a design that's really simple with year-round versatility, try making some simple horizontal stripes on the glass. 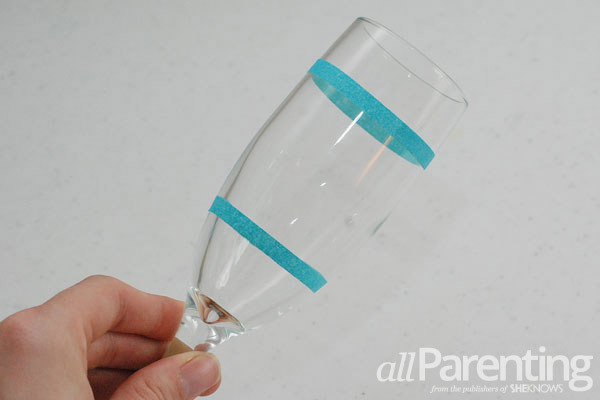 Use the 1/4-inch patterning tape to tape around the glass 1-inch from the top of the glass and 1-inch from the bottom of the glass. Fill in the space in between with equally spaced lines of the 1/8-inch tape. Paint the spaces in between the tape with 2-3 coats of paint, allowing the paint to dry for 1 hour between coats. Remove the tape and allow the paint to cure for 21 days before washing. Don't tell Martha Stewart I told you this, but after a few days the glitter paint seems to be drying nicely. 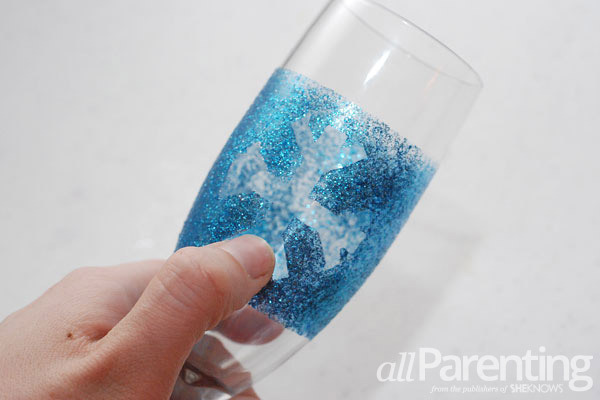 If you are extra eager to use your glitter glasses before the 21 day curing time, you might be able to get away with very carefully hand washing them, but do so at your own risk. 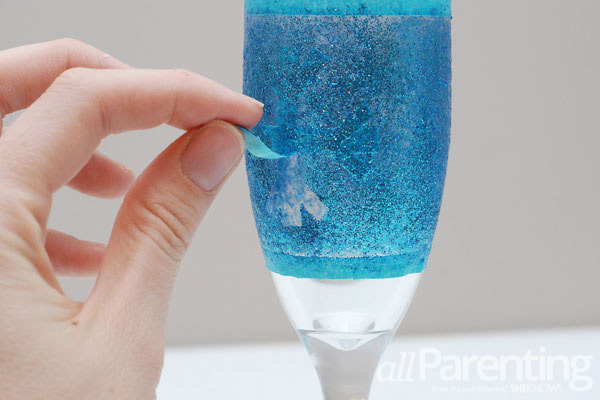 The glitter paint colors used in this tutorial are: smoky quartz, lapis lazuli and aquamarine crystal.